Sheer fabric with damask embroidery layered over pink. Sham made of silk, polyester, cotton, and nylon. Beaded silk, pink silk, and damask with cord finish are among the fabrics and trims that add to the opulence. Dry clean. 19" x 39". Imported. Velvet center with gimp lattice; animal sides. Cotton/viscose front; cotton/polyester back. Finished with cording and tassel fringe. Dry clean. Made in the USA of imported materials. 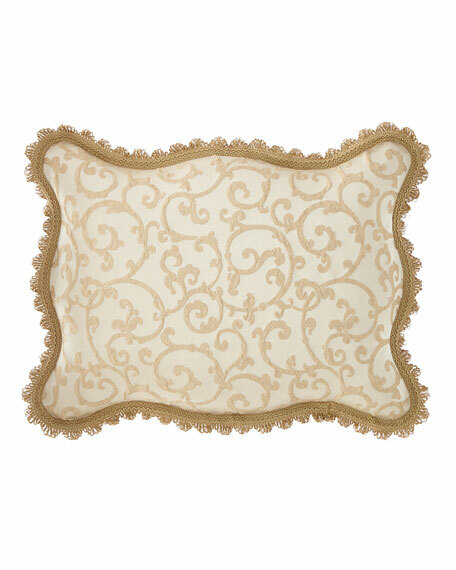 Scalloped sham with damask center has ruched silk accents, tassel fringe, and twisted cording. Front is polyester/cotton chenille and silk. Scalloped sham with damask center has ruched silk accents, tassel fringe, and twisted cording. Front is polyester/cotton chenille and silk. Cotton/polyester back. 19" x 35". Dry clean. Made in the USA of imported materials.